Hydrogen peroxide (H2O2) and nitric oxide (NO) are two key molecules representative of two families of related compounds designated as reactive oxygen and nitrogen species (ROS and RNS, respectively). Our present knowledge about where, when, and how these molecules are produced in a specific plant tissue either under physiological or stress conditions and how they interact support the relevant crosstalk between these molecules which in many cases are autoregulated throughout posttranslational modifications. Thus, either S-nitrosation or nitration of different enzymes of the ROS metabolism including superoxide-generating NADPH oxidase (NOX) or antioxidant enzymes such as catalase and superoxide dismutase (SOD) and components of the ascorbate-glutathione cycle may take place under diverse situations. However, H2O2 and NO may react among them giving rise to a more powerful toxic species, the hydroxyl radical (·OH), which may react with most biomolecules (nucleic acids, proteins, and lipids), leading to irreversible damages within cells. 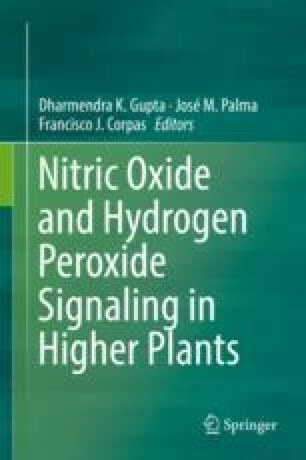 This chapter will provide a comprehensive and easy overview about H2O2 and NO production, on how these molecules are generated within different cell compartments, and about their metabolic interaction. A proposed model on how such interaction between H2O2 and NO may influence the organelles’ signaling network under normal physiological and stress conditions and/or developmental metabolic shifts is discussed. This work has been supported by the ERDF-cofinanced grant AGL2015-65104-P from the Ministry of Economy and Competitiveness and Junta de Andalucía (group BIO-192), Spain.